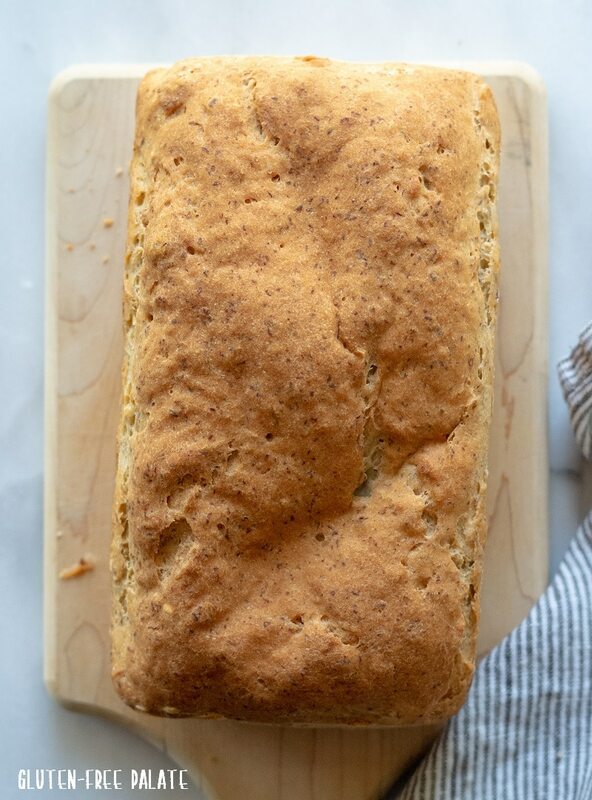 A homemade gluten-free bread recipe that’s simple to make, dairy-free, and bakes into the best gluten-free bread. Make your next lunch with this easy gluten-free sandwich bread. 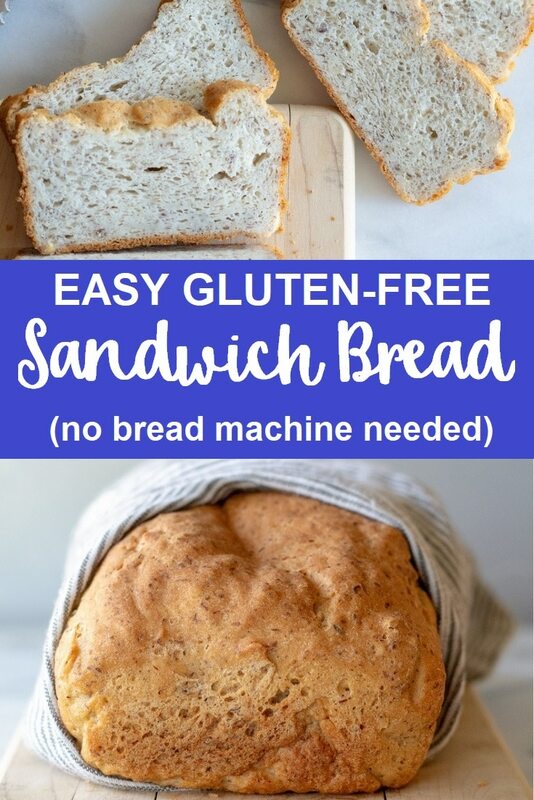 I’ve also included instructions for making this gluten-free bread in a bread machine for those who prefer to use a bread machine when making gluten-free bread. 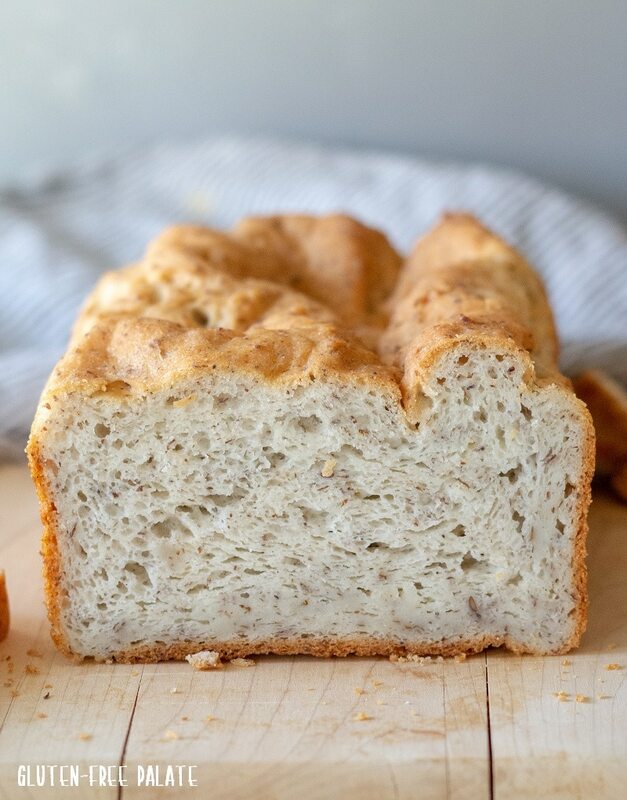 You’re going to want to make everything with this gluten-free bread. Deli style sandwiches, grilled cheese sandwiches, french toast … everything. I posted a gluten-free bread recipe back in early 2015. It was okay, but it wasn’t the best gluten-free bread. It had a little bit of a quick bread texture. I pulled it down last year until I could revamp the recipe. I’m excited to say that I’ve improved it tons! It’s now the best and easiest recipe (in my opinion and hopefully yours). I also now have a gluten free bread recipe for the bread machine (see further down if you use a gluten-free bread machine). Just look at the texture in this easy gluten-free bread. It’s amazing. The gluten-free loaf featured in this picture could’ve used a few more minutes in the oven but I’ll talk more about that below. 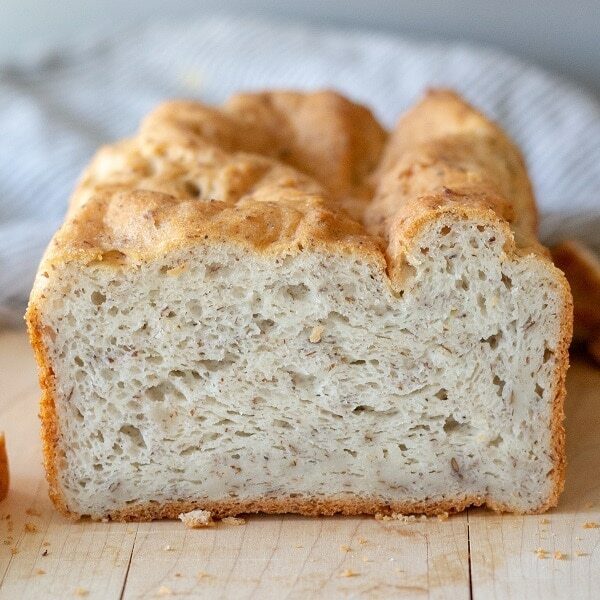 You are going to love this gluten-free dairy-free bread. I promise. Please, please read through this post. I share my experience and what worked and didn’t when I was reworking this gluten-free bread recipe. If you have question please leave a comment. I will get back to you. 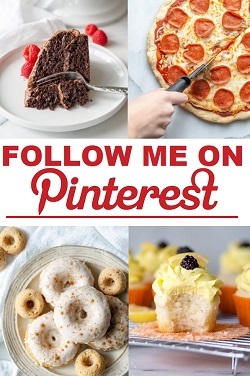 If you are looking for a gluten-free pizza recipe or a gluten-free cheesy breadsticks recipe. I have those too. And they are equally amazing. 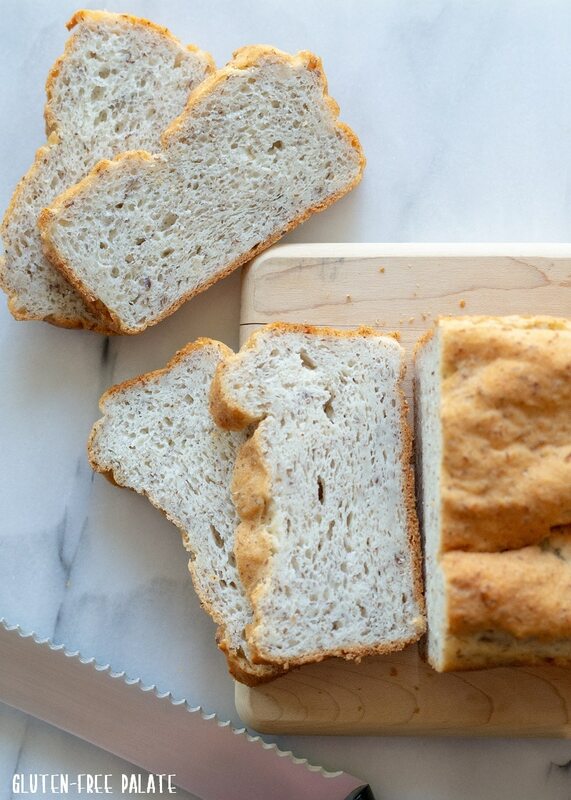 When I first made this gluten-free bread recipe I used my gluten-free flour blend. It works great, but I realized it needed something more. I tested several different flour blend options before settling on the winner, the one that I think makes the best gluten-free bread. Here’s what I used and what results I had. 2 1/2 cups of my gluten-free flour blend + 1/2 cup of almond flour + 1/4 cup flaxseed meal (ground flaxseed) – This yielded a great loaf of bread but it wasn’t the winner. I realize not everyone can have nut flours or almond flour so I also tested a batch with 2 1/2 cups of my flour blend + 1/2 cup of millet flour + 1/4 cup of flaxseed meal. To be honest, I couldn’t tell the difference. It tasted the same and the texture was the same. It’s an amazing nut free gluten free bread. 2 1/2 cups of Bob’s Red Mill 1-to-1 gluten-free flour blend + 1/2 cup of almond flour + 1/4 cup flaxseed meal – this was really good but it was a little on the heavy side. It didn’t rise quite as much. If you don’t want to mix flours, then I recommend this combination. If you can’t have nut flours use 2 1/2 cups of Bob’s Red Mill 1-to-1 gluten-free flour blend + 1/2 cup millet flour + 1/4 cup flaxseed meal. 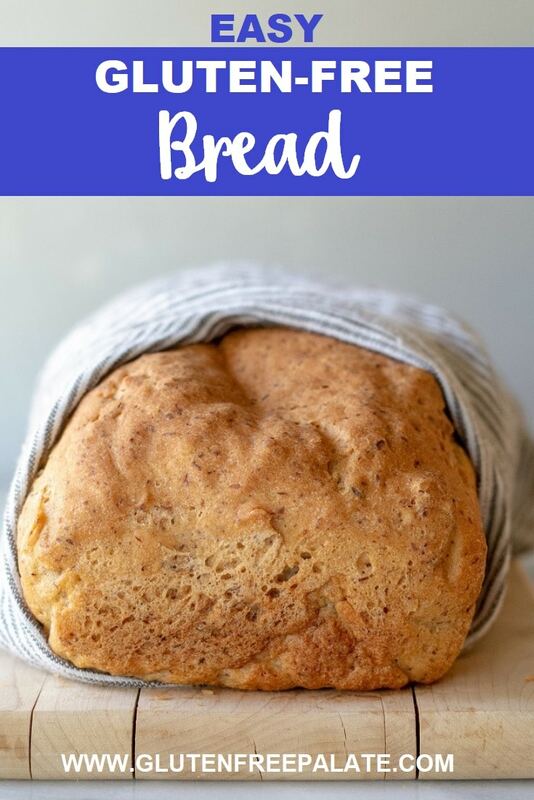 This gluten-free dairy-free bread was originally developed for the oven but I have a gluten-free bread machine recipe below. For this recipe I give the flour measurements in measuring cups and weight below in the recipe card so you can use either method. Per a recommendation from my friend Megan from Allergy Free Alaska (who is a bread-making goddess) I ended up breaking down the flours further and the BEST gluten-free bread recipe is below, in the recipe card. But again, if you don’t want to mix flours or don’t have them all on hand, use option 3 above. And If you don’t believe that my friend Megan is a bread-making goddess just look at her homemade gluten-free hamburger buns. Dang! So good. I haven’t finished testing an egg-free version of this gluten-free bread recipe. I am working on testing it with aquafaba and chia egg. I will report back when I’ve finished. I still can’t get over how amazing this gluten-free sandwich bread is. It’s better than any gluten-free bread I’ve had and my family, including my gluten-eating husband agrees. Let’s talk about dairy next. This gluten-free bread is also dairy-free. I’ve tested it with dairy (milk for activating the yeast and butter instead of oil) and I found it to add to the quick bread texture. If you want this gluten-free bread to have the same texture as deli style sandwich bread then you need to use water when activating the yeast and oil instead of butter. Trust me. Plus, it’s less expensive to use water and oil in gluten-free bread recipes than it is to use milk and butter. 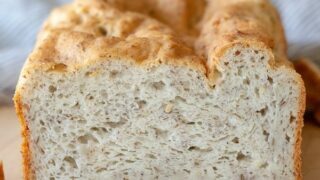 I use xanthan gum in this gluten-free dairy-free bread recipe. I feel it yields the best results. Not everyone can have gums. You can use psyllium husk powder (not full husks) in this recipe. I only tested is once, but I used 3 tablespoons of psyllium husk powder in place of the xanthan gum – yes, that reads 3 TABLESPOONS. Psyllium husk powder is not a 1-to-1 for xanthan gum. Again, I only tested this one time so I cannot claim that this is the best sub for xanthan gum. Sure it worked for me, but I haven’t checked to see if it’s repeatable with that amount of psyllium husk powder. This gluten-free bread recipe works best when baked for 60-65 minutes in the oven or on the gluten-free setting in a bread machine. See my notes on gluten free bread recipe for the bread machine below. The picture at the top shows a loaf only baked for 55 minutes in the oven. I got a little impatient. When baked longer it finishes rising and you wont get that gummy texture at the bottom. Remember to cover your gluten-free bread with foil half-way through baking so it doesn’t over-brown. You might read that a loaf is done baking once it hits around 200 degrees F. Please bake this loaf 60-65 minutes even if your thermometer says otherwise. Here are my tips that work with this gluten-free bread recipe. See blow for my gluten free bread machine recipe. Don’t substitute anything unless I specified above that I’ve tested it. This is important. If you substitute something I can’t guarantee anything and I can’t help you troubleshoot if something doesn’t work in your gluten-free bread. Ingredients at room temperature work best. You can always run your eggs under warm water for a couple minutes to bring the temperature up. Read the recipe instruction and get all ingredients out before you start. Use dry active yeast or quick yeast BUT NOT INSTANT YEAST. If your bread sinks in the middle before it is done baking you most likely let the yeast proof sit too long before using it or you let your bread rise too long (or possible you used instant yeast?). You want put your gluten-free bread in the oven when it rises just above the top of the loaf pan, no longer. Make sure your water is between 95-110 degrees before adding the yeast. 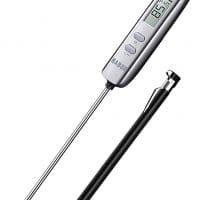 If you don’t have a thermometer I suggest you get one. Line the loaf pan with parchment paper and then spray it with oil, this will help you remove the loaf from the pan. Pan size matters. If you use a wider pan your loaf will be wider, and shorter. If you use a narrower pan your loaf baking time might change. Again, if you have any questions on how to make gluten free bread please leave me a comment below. I’ve included a video that shows step-by-step how to make gluten-free bread. If you prefer to make this gluten-free bread recipe in a bread machine make sure you have one with a gluten-free setting. 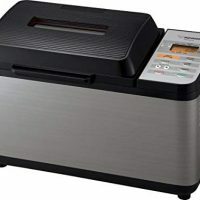 I have a Zojirushi BB-PAC20 (affiliate link) and it makes a beautiful loaf and is my preferred gluten-free bread machine. Add the warm water, oil, egg whites, and vinegar to the pan in your gluten-free bread machine. Whisk together all dry ingredients except for the yeast (sugar, flours, flaxseed, xanthan gum, baking powder, and salt) and add to the bread machine pan on top of the wet ingredients, in a mound. Make a hole in the center of the top of the dry ingredients and add the yeast. Don’t let the yeast touch the wet ingredients. If your machine has a “rest” setting. Cancel it, you don’t need it. With the Zojirushi you have to do this before you select any other settings. Select the gluten-free bread setting on your machine. Close the lid and press “start”. When working with or measuring gluten-free flour, spoon the flour into the measuring cup and level. Do not scoop your measuring cup into the gluten-free flour. For this recipe I’ve also included the weight measurements. 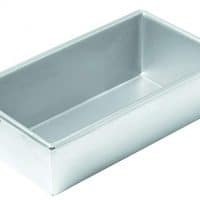 Line a 8-inch x 5-inch metal loaf pan with parchment paper and spray it with cooking spray; set it aside. Add the sugar and yeast to your warm water (95°F-110°F) and stir; set it aside for 5-10 minutes but no longer. While your yeast is proofing, in the bowl of a stand mixer fitted with the paddle attachment, add the flours, flaxseed meal, xanthan gum, baking powder, and salt. Turn your mixer to low and mix just until combined. With the mixer still going, add the oil, egg whites, vinegar, and proofed yeast mixture. Turn the mixer to a medium speed and mix for an additional 2 minutes. The dough will be thick and sticky. Using a rubber spatula, add the dough to your prepared loaf pan making sure to fill in the corners of the pan and level the top. Wet your fingers and smooth the top. Cover the dough with a lightly oiled piece of plastic wrap and allow it to rise in a warm place for 45 to 60 minutes, or until it has risen slightly above the loaf pan. When the dough is near the top of the pan, preheat your oven to 350°F. Remove the plastic wrap and bake for 60 – 65 minutes. Half way through baking, cover the bread loaf with a piece of foil to keep it from over-browning. Remove the loaf from the oven and let cool completely before slicing. Slice the entire loaf and store in a container at room temperature for up to 4 days or in the freezer for up to a month. 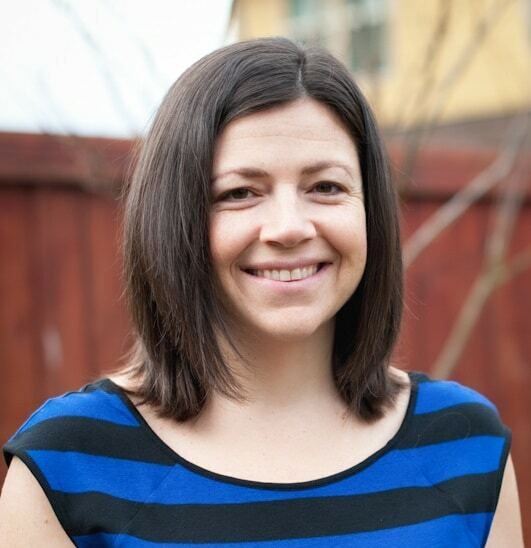 I hope I’ve set you up for success with making the best gluten-free bread you’ve ever had. If you have any questions about this gluten-free bread recipe, leave a comment. Also, if you make it I want to know what you thought! Please come back and share your experience. I don’t have a recipe for bagels but you might like these Gluten-Free Bagels from Salted Plains. And if you’re looking for rolls try these Gluten Free Rolls. 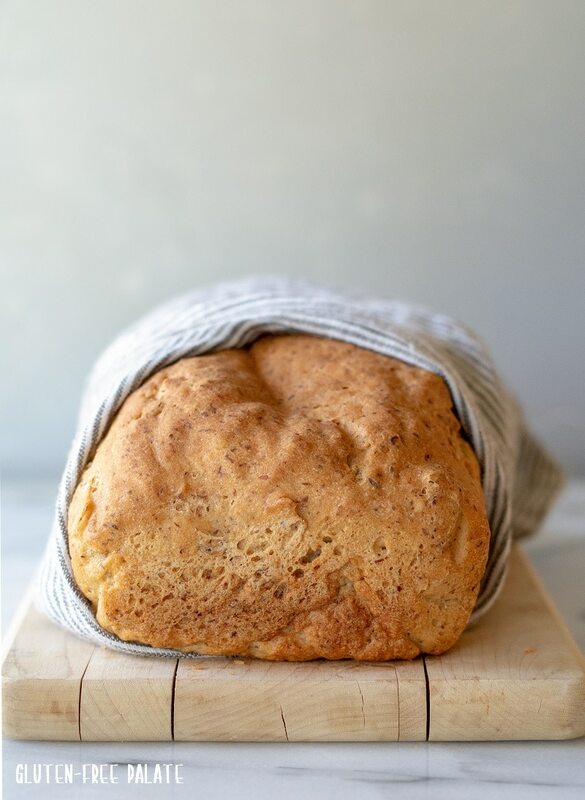 A homemade gluten-free bread recipe that's simple to make, dairy-free, and bakes into the best gluten-free bread. Make your next lunch with this easy gluten-free sandwich bread. Add the sugar and yeast to your warm water (95-110 degrees F) and stir; set it aside for 5-10 minutes but no longer. While your yeast is proofing, in the bowl of a stand mixer fitted with the paddle attachment, add the flours, flax seed meal, xanthan gum, baking powder, and salt. Turn your mixer to low and mix just until combined. Please read all the tips and tricks in the post before you get started. If you prefer to use a bread machine, check further up in the post for instructions. 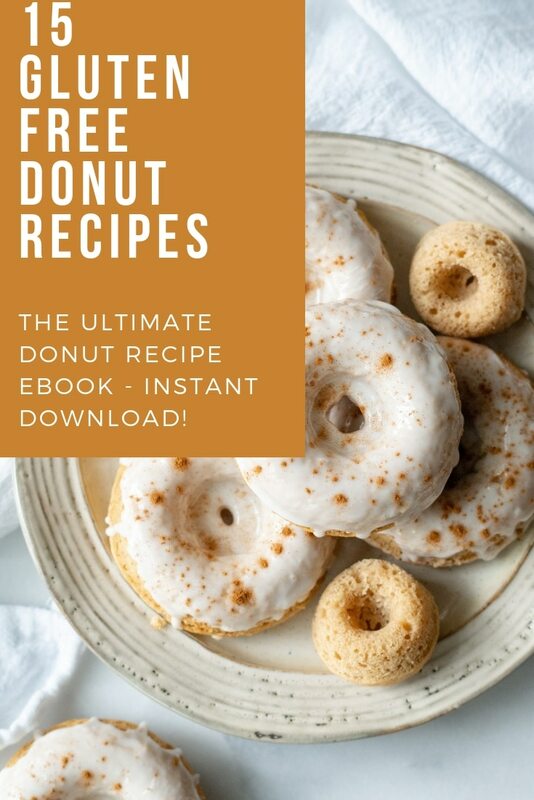 For the gluten-free bread machine recipe, add wet ingredients to the pan, and then dry ingredients except the yeast, make a hole in the center of the dry ingredients and then sprinkle the yeast into the hole. See complete instructions just above the recipe. Make sure your water is between 95-110 degrees before adding the yeast. This is warm to the touch, but not hot. If you can't have nut flours use 2 1/2 cups of Bob's Red Mill 1-to-1 gluten-free flour blend + 1/2 cup millet flour + 1/4 cup flaxseed meal. Not everyone can have gums. You can use psyllium husk powder (not full husks) in this recipe. I only tested is once, but I used 3 tablespoons of psyllium husk powder in place of the xanthan gum. How do I substitute brown rice flour for the white? I haven’t tried brown rice flour in this bread recipe and I’m not sure if it would yield the same results, but you could try a 1 for 1. I made this bread in my bread machine. I followed it to a T with only one substitution. I used sorghum flour instead of flaxseed. And guess what, it still turned out GREAT! This is a true testament to what a great recipe this is. Thank you!! I am so glad you liked it! Thanks for stopping by. Can I substitute flax seed meal with chia seeds instead? Flax seeds tend to give me more hot flashes. I haven’t tried subbing it out but a reader left a comment that she used sorghum instead of flax and it turned out great. Hope that helps! Let me know how it turns out. It’s the best gluten free bread ever, so soft even for the next day, no more bread from store for me, love it! I am so glad you think so! Thank you for stopping by and letting me know you love this bread recipe. I was just wondering if I would still do the yeast proof step if I wanted to make the bread in my bread machine or is that step only if baking in the oven. Thanks! Add the warm water, oil, egg whites, and vinegar to the pan in the bread machine. I hope that helps! Let me know how it turns out. Have you tried replacing the each egg whites with chia eggs or flaxmeal egg substitutes? I haven’t tried it yet but I am making a couple loaves this next weekend and I will try to remember to test one with chia-egg. Because It already calls for flaxseed meal I probably wouldn’t try it with the flaxegg.